On Friday March 8th I posted the above drawing on Instagram – with some trepidation – in honour of International Women’s Day. The point of my post was that a good life model works in creative partnership with the artist. I’ve looked at the relationship between artist and model before but it’s intriguing enough, I think, to return to it. Art history is littered with cautionary tales about (male) artists and (female) models. The beguiling model attracts the eye of the painter and soon captures his heart too, but his heart is a fickle as his eye and before long she emerges as a broken shadow of her former self. Or two artists fall in love and the male half of the relationship decides he’ll paint his lover and somehow her career becomes subservient to his: she is no longer an artist but his muse. Camille Claude, an astonishingly talented artist in her own right, but during her lifetime known only as Rodin’s model, is one of the more tragic instances of the latter. I say I posted my hommage to the life model with trepidation because there was another hashtag around on that day, #refusetobethemuse. At first sight, there could well be confusion between the model and the muse, especially as they are often the same person. However the connotations of the word muse run deeper. “As women, for centuries we were not allowed to be artists but we were muses,” artist and self-described muse Coco Dolle has told HuffPost. “We were always venerated in that sense. And I feel that legacy is still prevailing. It’s part of the romantic idea of the art world.” The mythical origins of the word ‘muse’ keep it firmly planted in a fantasy world, perhaps, enabling the exploitative or the unscrupulous to take advantage of blurred lines. 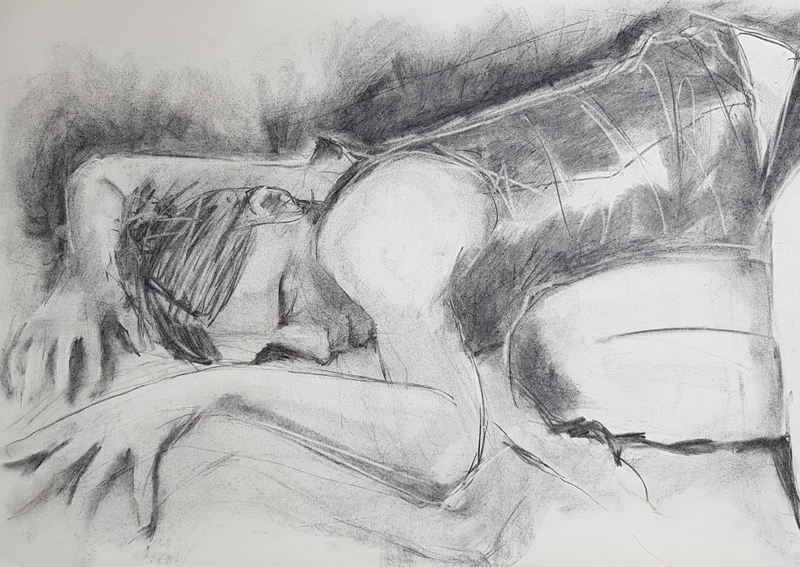 The professional life model, however, should never be confused with a muse. He or she might inspire but it’s more of a collaboration, a joint effort to produce a finished piece, at least with the best life models. Certainly in the three years or so I’ve been drawing Blue King, the model in the above pieces, it has been a process of discovery, a dialogue, so to speak, between pose and drawn line. 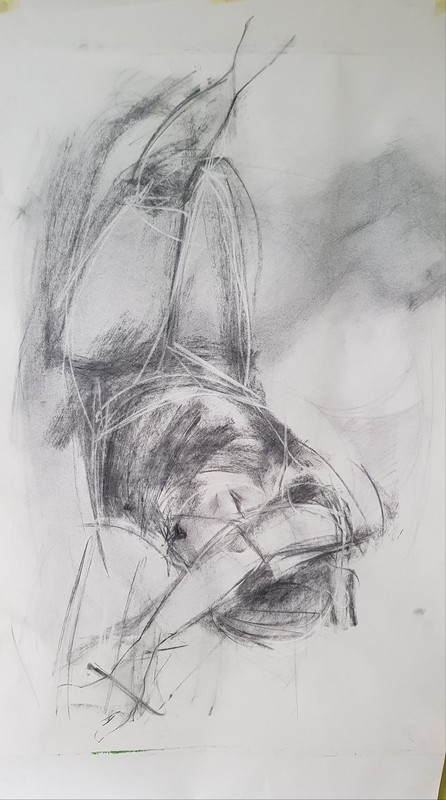 My development to a looser style of drawing, as I mentioned in my previous post, has been encouraged by the teacher, Annabel Mednick, but enabled by Blue’s fascinating, and sometimes challenging poses, which seemed to demand something beyond direct representation. It is that partnership that I was celebrating on International Women’s Day. I recently visited Thomas Gainsborough’s house in Sudbury, now a museum with a delightful small garden, to see an exhibition of sculpture by Nicole Farhi. In case you don’t know, Ms Farhi was a successful fashion designer who began her professional career with French Connection but went on to found, and later sell, her own label. Mentored by the sculptor, Eduardo Paolozzi (“He is in my soul, I still hear him”), she began to sculpt in her own right, something which she now does full-time. One of my favourite blogs here on WordPress is The Sculptor’s Wife. Written by Tamsin, the partner of Sam Shendi, it details the trials and achievements of a successful artist through the eyes of his wife, along with her own attempts to draw and write while bringing up a young family. In one post, she quotes someone saying that sculpture is “the thing you bump into when you step back to look at a painting” – I’m ashamed to admit that has often been my view. Nicole Farhi’s work is wonderfully tactile: knobbly heads of friends and celebrities such as Dame Judi Dench and Bill Nighy, the wide expressive hand of Paolozzi, the eggshell-smooth expressive arm of a dancer. Resisting the urge to touch and feel, I could have spent hours in that room – and I’m sure I’ll return before the exhibition closes in June. 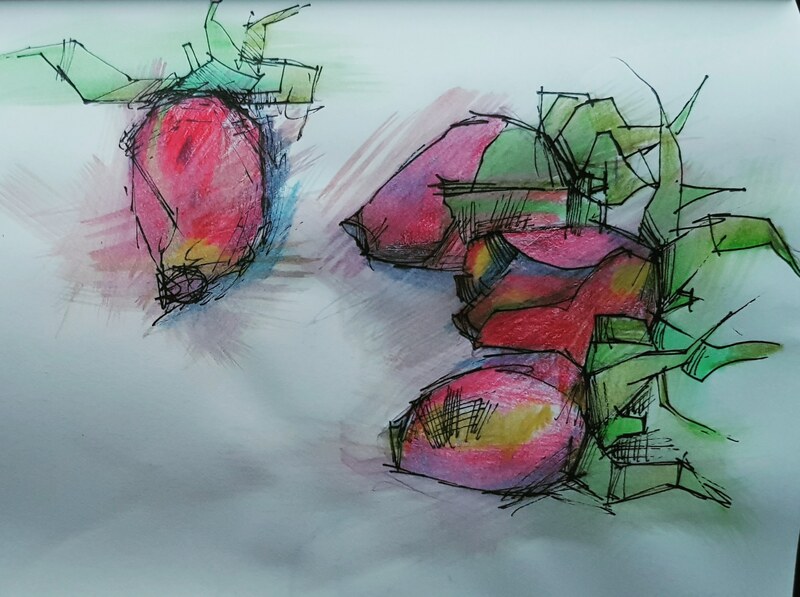 My friend and I both stood in front of our favourite pieces and explored their intriguing contours by drawing them in pencil in our sketchbooks (mine is above). It was wonderful, inspiring work to see and contemplate on an unseasonably warm February afternoon in Suffolk. Faces and bodies have occupied me for the past few weeks. 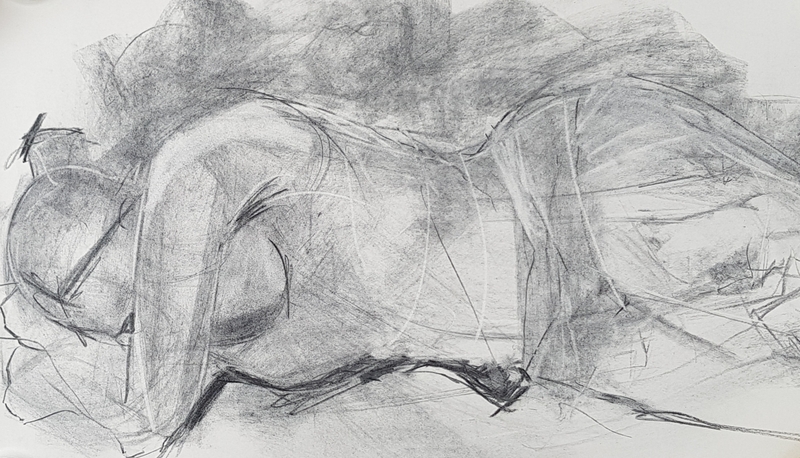 Most Wednesday evenings I attend Annabel Mednick‘s life drawing classes in Ipswich. They are a fascinating collaboration with her model, Blue King, and cruising is not an option. Close observation and energetic mark-making are the order of the evening: Annabel pushes you out of the secure womb of your comfort zone into the world of taking chances. Two years ago I told her I wanted to draw more loosely, more freely, less prettily, and over the past few weeks I finally feel I’m getting there. It has taken that long to summon the courage to let go and not feel I’ve failed if I haven’t produced something you might want to hang on a wall. 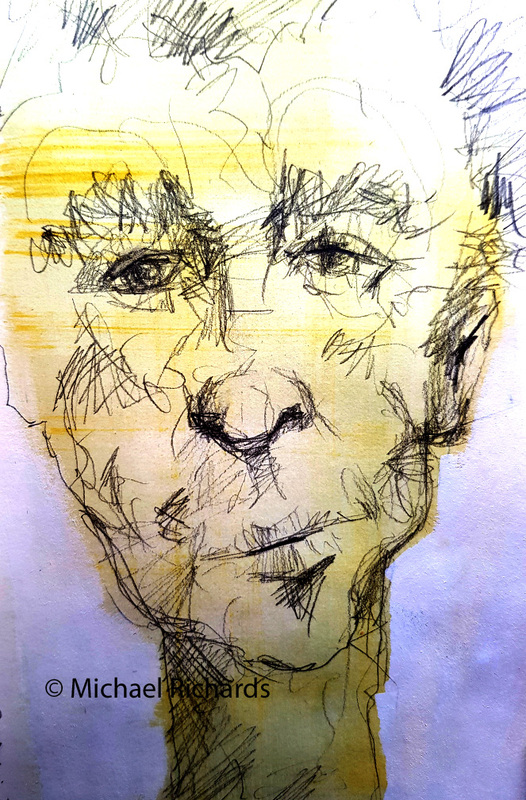 I realised last week, standing in front of a particularly engaging head by Ms Fahri, that what I was trying to do was to achieve in charcoal and paper something of the energy that she teased out of clay and bronze: “I talk to the to the clay, and eventually a recognisable form emerges… It’s a miracle!” In my own small way, I think I’m getting there. 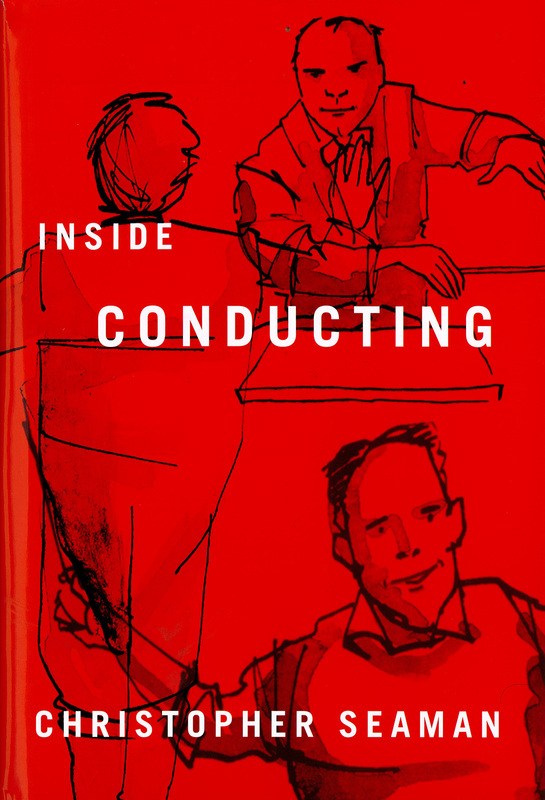 Mark Dery has bravely published the first full-length biography of writer and illustrator Edward Gorey, who died in 2000. It runs to over 500 pages which, bearing in mind Gorey did little except go to the New York City Ballet and draw, is probably too long. Dery is an astute interpreter of Gorey’s art and writing, but spends far too long speculating on Gorey’s sexuality and his shortcomings as a fully-rounded human being (show me a great artist who is). I used to be mildly obsessed with Edward Gorey, ever since a good friend showed me a copy of The Doubtful Guest, which had been given to her by a New York gay couple who were friends of her father. I started buying his intriguing little books in the pre-internet days when one had to write letters to the Gotham Book Mart in NYC and send them international money orders as payment. I’ve no idea how many hours I spent in my twenties just cross-hatching like the Master. Anything that is art…is presumably about some certain thing, but is really always about something else, and it’s no good having one without the other because if you just have the something it’s boring and if you just have the something else it’s irritating. He continues that things ‘that on the surface…are so obviously’ about one thing make it ‘very difficult to see that they are really about something else entirely’ (unfortunately Mark Dery then goes on to say that this demonstrates Gorey’s ‘Derridean-Beckettian awareness of the limits of language’ and ‘his Asian-Barthesian belief in the importance of ambiguity and paradoxes as spaces where readers can play with a text, making their own meanings’). I’ve spent a long time on this blog trying to pin down the ‘something else’. I think we can agree that whatever we are inspired to draw or paint, that object or landscape is more than just that picture on the paper. Take the drawing of Rosie, the retriever-samoyed cross, above. On one level it’s a drawing of a dog using a Prismacolor indigo pencil on Stillman and Birn gamma paper. 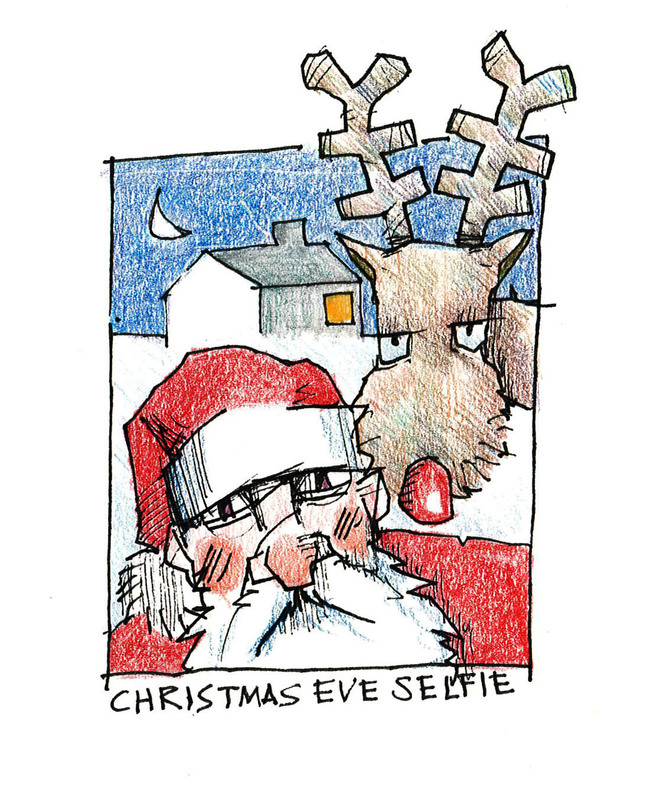 The ‘something else’ might well be my affection for Rosie and her owners, my enjoyment of my time with them all, my drawing Rosie as an expression of my feelings about being welcomed into someone’s home and family life over Christmas, how much I miss my own departed greyhound, and so on. What it isn’t, ultimately, is just a drawing of a dog. Gorey has it spot on that ‘if you just have the something it’s boring’. Have you ever started drawing or painting something and you feel you’re just going through the motions, that what you’re doing is so superficial that you simply can’t face taking it any further? 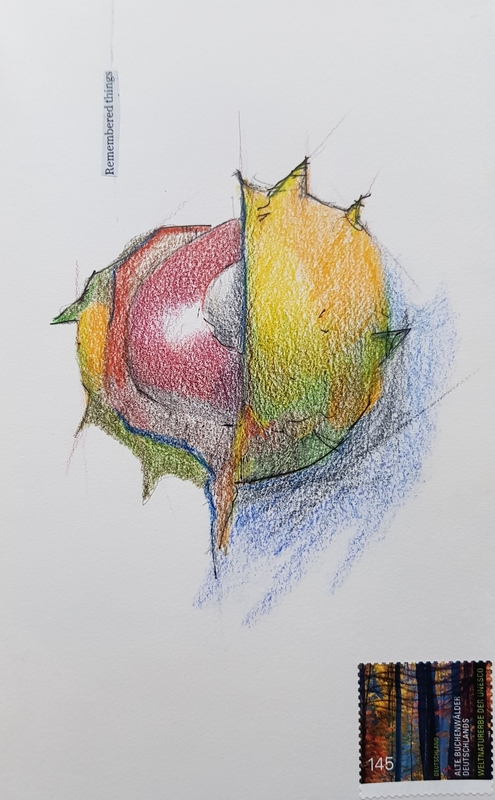 You might be surprised to learn that I’ve occasionally started drawing a piece of fruit and have abandoned it because it simply bores me to death, and if I don’t like drawing it why should you like looking at it? I believe that’s just having the ‘something’ in Gorey’s Great Simple Theory. I once met a painter who gave his landscapes titles like ‘Heartbreak is the end of all of love’s journeys’. That might well be true but it had the effect of not letting you see his paintings of nature as anything other than symbols of his inner turmoil. This is, perhaps, an example of when you ‘just have the something else [that’s] irritating’. It’s frustrating seeing or hearing something that you think is simple and its creator telling you it’s actually incredibly profound. Van Gogh did inner turmoil to a tee, but he called his paintings “Starry Night” or “Crows Over a Cornfield” not “I’m so wired up I’m going to punch Gauguin in the face any minute”, allowing us to form our own interpretation. That, at least, is my take on Gorey’s Great Simple Theory. You might see it very differently, which is fine with me. And with Edward Gorey, I’m sure. Recently I’ve been dipping into a book called Preaching in Pictures: Using Images for Sermons that Connect by Peter Jonker. I’m not about to write a sermon any time soon and I’m not even particularly religious, but I was told about the book by a dear friend and became interested in the author’s take on creativity. The Reverend Jonker is himself a thoughtful man and a creative thinker (you can sample his very engaging sermons from LaGrave Christian Reformed Church in Grand Rapids, Michigan, online if you wish). One of the images he uses in his book concerns two chairs. Writing a sermon, he suggests, involves a good amount of time sitting in the straight-backed chair of concentration: checking your text, looking up references, researching what others have said or written about the piece, etc. Then – here comes the good bit – you have assembled a ‘beautiful mess’: all that ‘stuff’ you’ve noted down, cut and pasted, bookmarked online – it’s all there in front of you in its magnificent disarray and on Sunday morning you’ve got to engage the interest of your congregation – some of whom are sleepy from the night before or looking forward to a late brunch after the service. So then you switch to the comfortable chair of contemplation. You move the pieces around in your mind, you try to pick out a thread from all these post-it notes in your head, you put the variations on your original theme in an order that produces a meaningful melody. It’s a more gentle process than the straight-backed chair phase but don’t let anyone think that you’re dozing because you’re sitting in the comfortable chair – your mind is still working. The Mindfulness community will tell you something similar: if you keep rushing around you’ll achieve less than if you are able to give yourself space to breathe, to clear the table so you can see the pieces of the puzzle more clearly. The painting of the quince above (don’t worry, it’s my last one for this season) lay unfinished on my desk for weeks. 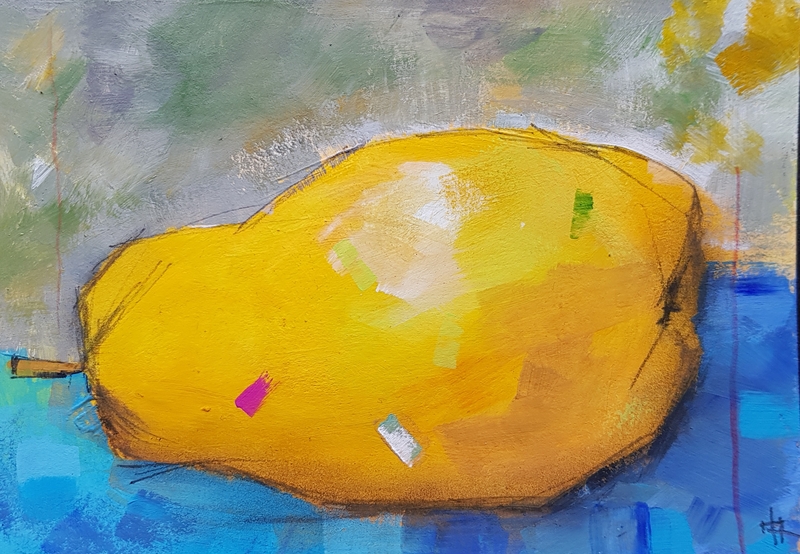 When I first started painting it, I was determined to dash this off in one sitting: it’s a single fruit, for heaven’s sake, how complex can that be? More than I’d thought, is the answer. 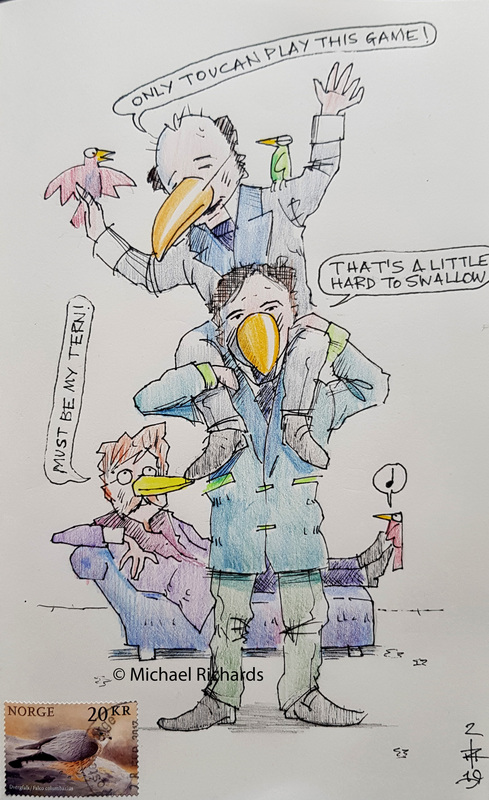 Eventually, by sitting in the comfortable chair for some weeks (metaphorically – life isn’t that kind to me), I solved the problems with the picture and in less than twenty minutes one evening, finished it. “Aren’t you just saying, take a step back?” you ask. Indeed, but that conscious switching to the comfortable chair of reflection is a powerful process, I’d argue. How many times do you feel like a fly in a bottle, banging your head against the glass sides, before you actually say to yourself, let me just sit down and think this through? My New Year’s Resolution, if I did such things, would be to spend more time switching between the two chairs. In drawing and painting, too, there are straight-backed chair phases, but I know my creative process will benefit from mentally standing up, going into a different space, pouring a glass of red wine (I’m elaborating on Peter Jonker’s image, I realise – but, y’know, it’s my blog), and spending some time in the comfortable chair of contemplation thinking through what I’m trying to achieve.